Cardiovascular symptoms and signs are the main clinical manifestations associated with anaphylactic (IgE mediated) or anaphylactoid (non-IgE mediated) and allergic or hypersensitivity episodes. However, it was not until seven decades ago that such reports started to appear in the English, German, and Austrian medical literature [1-6]. Early reports were mainly on cases caused by serum sickness and tetanus antitoxin, and were characterized as “morphologic cardiac reactions”, “acute carditis”, or “lesions with basic characteristics of rheumatic carditis”. The detailed description of “allergic angina syndrome” as coronary spasm, a manifestation of endothelial dysfunction or microvascular angina and progressing to acute “allergic myocardial infarction”, was not described until 1991 . Today, allergic angina and allergic myocardial infarction are ubiquitous diseases covering a wide spectrum of mast cell activation disorders that affect patients of any age. They involve numerous and continuously increasing causes, and are collectively referred to as ‘Kounis syndrome’. This syndrome is described as a new clinical entity in major cardiovascular medicine textbooks. Kounis syndrome is defined as the coexistence of acute coronary syndromes including coronary spasm, acute myocardial infarction, and stent thrombosis, with conditions associated with mast cell and platelet activation. Interrelated and interacting inflammatory cells, such as macrophages and T-lymphocytes, are involved in these allergic or hypersensitivity and anaphylactic or anaphylactoid insults. This syndrome is caused by inflammatory mediators such as histamine, platelet-activating factor, arachidonic acid products, neutral proteases, and a variety of cytokines and chemokines released during the allergic activation process . In this activation cascade, a subset of platelets is also involved via FcγRI, FcγRII, FcεRI, and FcεRII receptors situated on the platelet surface . Mast cells decisively influence the inflammatory process, despite being a numeric minority in this inflammatory cascade. All of these inflammatory cells participate in a vicious inflammatory cycle in which they can activate each other via multidirectional signals. Mast cells that interact with macrophages and T-lymphocytes via multidirectional stimuli are the primary inflammatory cells involved in the development of Kounis syndrome. Platelets bearing FCγRI, FCγTII, FCεRI, and FCεRII receptors are also involved in the allergic activation cascade . Mast cells enter the circulation from bone marrow as mononuclear cell precursors and circulate to all human tissues. Although mast cells can go to brain tissue, the brain is not affected by allergic reactions because IgE antibodies cannot cross the blood-brain barrier. Mast cells differentiate and mature in tissues, in a process that takes several days or up to weeks. In contrast, basophils mature in bone marrow from granulocyte precursors and enter the circulation as mature cells; they do not immediately go into tissues, moving there only during the late stage of an allergic reaction. During allergy, hypersensitivity, or anaphylaxis, activation of mast cells takes place, and a variety of stored and newly formed inflammatory mediators are released locally and in the systemic circulation. These include biogenic amines such as histamine, chemokines, enzymes such as the neutral proteases, chymase, tryptase, cathepsin-D; peptides, proteoglycans, cytokines, growth factors, arachidonic acid products such as leukotrienes, thromboxane; prostacyclin, platelet-activating factor (PAF) and tumor necrosis factor-α (TNF-α). Most of these mediators have important cardiovascular actions. These pre-formed and newly synthesized inflammatory mediators are released locally and enter the systemic circulation. They can cause either coronary artery spasm that can progress to acute myocardial damage, or immediate coronary thrombosis that constitutes the main clinical manifestations of Kounis syndrome. Kounis syndrome does not seem to be a rare disease. However, it is infrequently recognized and diagnosed in clinical practice, and reported in the medical literature. There is a paucity of large prospective trials that aim to determine exact incidence and prevalence. In a recent prospective study , it was found that of 138,911 patients admitted to a hospital’s emergency department during one year, 793 presented with complaints of allergy. Of these, 769 were admitted with urticaria and 24 with angioneurotic edema. Therefore, the incidence of allergy admissions during one year was 5.7 per 1,000 patients. At the emergency department in that year, the incidence of Kounis syndrome among all admissions was 19.4 per 100,000 (27/138,911), and 3.4% among allergy patients (27/793). Of 51 cases of Kounis syndrome reported to the International Pharmacovigilance Agency (VigiBase™) during the period 2010–2014, almost half (22 reports) occurred in 2014. Most cases occurred in the USA, and non-steroidal anti-inflammatory medications were the most frequent trigger drugs . Some of the causes of Kounis syndrome are climate and environmental conditions, pollen cross-reactivities, hymenoptera exposures, overconsumption of medicines, inadequacy of preventative measures, and gene–environment interactions starting in early life. Indeed, a patient who had been admitted with chest pain to the emergency department, hospitalized for coronary vasospasm, and diagnosed to have Kounis syndrome, also had heterozygous E148Q mutation . It is anticipated that with increased awareness of the existence of Kounis syndrome and the conduct of large prospective trials, the true estimation of its incidence will be determined. 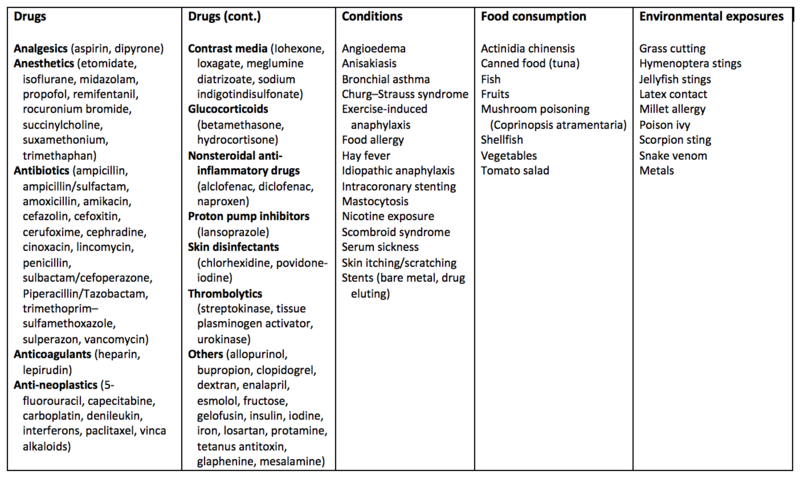 A variety of drugs, environmental exposures, foods, and other conditions are the main triggers of Kounis syndrome (Table 1). The most recently identified offenders for food-induced Kounis syndrome are fish, shellfish, fruits, vegetables, and canned food. Histamine fish poisoning (scombroid syndrome), anisakiasis, caused by nematode parasite, and kiwifruit (actinidia chinensis) allergy are some characteristic causes of food-induced Kounis syndrome. Scombroid syndrome or histamine fish poisoning is a histamine toxicity condition resulting from the consumption of spoiled fish . Fish flesh contains the amino acid histidine. When fish is infected by gram-negative bacteria that contain the enzyme histidine decarboxylase, this enzyme converts histidine to histamine, which induces Kounis syndrome. Anisakiasis is another condition associated with ingesting raw or undercooked fish or seafood. It occurs when seafood is infested with anisakis simplex , a common nematode parasitizing fish, which secretes allergenic substances. Therefore, unlike scombroid syndrome, anisakiasis is an IgE-mediated food allergy and future abstention from eating raw or undercooked fish or seafood is always required. Kounis syndrome is easily overlooked and infrequently diagnosed, even though it is not a rare disease. Three variants of Kounis syndrome have been described . The type I variant (coronary spasm) seems to represent a manifestation of endothelial dysfunction or microvascular angina. This group includes patients with normal or nearly normal coronary arteries, without predisposing factors for coronary artery disease. In these patients, acute release of inflammatory mediators can induce either coronary artery spasm without increase in cardiac enzymes and troponins, or coronary artery spasm progressing to acute myocardial infarction with raised cardiac enzymes and troponins. The type II variant includes patients with quiescent pre-existing atheromatous disease, in whom the acute release of inflammatory mediators can induce either coronary artery spasm with normal cardiac enzymes and troponins, or coronary artery spasm together with plaque erosion or rupture manifesting as acute myocardial infarction. The type III variant includes patients with coronary artery stent thrombosis, in whom aspirated thrombus specimens stained with hematoxylin-eosin and Giemsa demonstrate the presence of eosinophils and mast cells. This variant is also diagnosed in patients with stent implantation who died suddenly. Histological examination of the coronary intima or media and/or adventitia adjacent to stents from these patients, show infiltration by eosinophils and/or mast cells. Takotsubo cardiomyopathy was named after a round-bottomed, narrow-necked fishing pot used for trapping octopus (“takotsubo” in Japanese), because of its resemblance to the left ventriculogram in affected patients. The condition is also referred to as transient left ventricular apical ballooning, stress-induced cardiomyopathy, takotsubo syndrome, apical ballooning syndrome, atypical apical ballooning, ampulla cardiomyopathy, broken heart syndrome, or transient left ventricular dysfunction syndrome. This condition affects individuals, mainly postmenopausal women, following periods of emotional distress. The presentation resembles acute myocardial infarction, with transient left ventricular dysfunction and mostly normal, but occasionaly abnormal, coronary arteries. Its etiology, pathophysiology, and treatment have yet to be determined. The incidence is 2.1% of female patients and 0.5% of all patients with ST-elevation myocardial infarction. This rate was reported in the recently published Harmonizing Outcomes with Revascularization and Stents in Acute Myocardial Infarction (HORIZON-AMI) trial . Several reports have associated takotsubo cardiomyopathy with Kounis syndrome [16, 17]. Takotsubo cardiomyopathy has been observed not only in patients suffering from anaphylaxis, but also in individuals simply observing and assisting in the treatment of anaphylaxis. This indicates that takotsubo cardiomyopathy represents a stress-induced myocardial stunning. Various cytokines released during stress conditions have been incriminated in inducing multi-vessel coronary artery spasm at epicardial or microvascular levels, which induce takotsubo cardiomyopathy. The drug of choice for anaphylaxis is adrenaline. However, excess doses might contribute to coronary spasm and transient takotsubo syndrome through direct myocardial stunning. On the other hand, the inflammatory mediators released during anaphylaxis can induce coronary spasm and takotsubo syndrome. Furthermore, in anaphylaxis, compensatory catecholamines such as adrenaline and nor-adrenaline are released by the renin–angiotensin–aldosterone system that together with histamine, stimulate the release of more catecholamines by direct action on the adrenal medullary cells. Catecholamine increase induces excessive activation of cardiac catecholamine receptors in the left ventricle, and plays a major role in the pathophysiology of stress-induced cardiomyopathy. In addition to this phenomenon, administration of catecholamines, such as adrenaline and noradrenaline, for hemodynamic support of anaphylactic shock, also increases the plasma catecholamine level. Catecholamine increase in patients with angina renders blood platelets more sensitive and more prone to aggregation and thrombosis. Indeed, adrenaline administration has been shown to induce acute drug-eluting stent thrombosis . Since anaphylactic reactions can also induce takotsubo syndrome, measurement of anaphylactic inflammatory mediators such as histamine, tryptase, chymase, leukotrienes, thromboxane, and PAF, or the use of corticosteroids or mast cell stabilizers for prevention and treatment, may shed light on its etiology and pathophysiology. Adrenaline, Takotsubo, Anaphylaxis, and Kounis syndrome (ATAK) seem to constitute a challenging contemporary complex  that needs further investigation in order to elucidate its etiology and pathophysiology, and to determine proper preventive and therapeutic measures. Α high index of suspicion is of paramount importance in the diagnosis of Kounis syndrome. Diagnosis is based on clinical symptoms and signs, as well as on laboratory, electrocardiographic, echocardiographic, and angiographic evidence. A variety of these findings might accompany allergic symptomatology, which helps in making the correct diagnosis. Newer diagnostic techniques such as cardiac magnetic resonance imaging (MRI) and myocardial scintigraphy can help to confirm the diagnosis. Increased serum tryptase, histamine, cardiac enzymes, and cardiac troponins are particularly helpful findings. Measuring cardiac troponins in all patients admitted to the emergency department with acute allergic reactions, in order to timely diagnose and appropriately manage a potential cardiac injury manifesting as Kounis syndrome, has been suggested . Echocardiography and coronary angiography are necessary for delineating the coronary anatomy, and for diagnosing cardiac wall abnormalities including takotsubo cardiomyopathy. Thallium-201 single-photon emission computer tomography (SPECT) and 125I-15-(p-iodophenyl)-3-(R,S) methylpentadecanoic acid (BMIPP) SPECT have been used for investigation of the type I variant of Kounis syndrome. They revealed severe myocardial ischemia, while coronary angiography showed normal coronary arteries . MRI with delayed contrast-enhanced images shows normal washout in the subendocardial lesion area in patients with Kounis syndrome type I variant . Treatment of Kounis syndrome is challenging because both cardiac and allergic symptoms need to be treated simultaneously. Drugs administered to treat cardiac manifestations can worsen allergy and drugs given to treat the allergic symptoms can aggravate cardiac dysfunction. With type I variant, the use of intravenous corticosteroids such as hydrocortisone at a dose of 5 mg/kg and H1 and H2 antihistamines such as diphenhydramine at a dose of 1 to 2 mg/kg and ranitidine at a dose of 1 mg/kg, are adequate. Vasodilators, such as calcium channel blockers and nitrates, can stop hypersensitivity induced vasospasm. Intravenous or sublingual nitroglycerin seems reasonable and safe in patients with Kounis syndrome if the blood pressure is satisfactory. Bolus administration of antihistamines should be done slowly as these drugs can precipitate hypotension and compromise coronary flow. Care should be taken to assure that all infusible medications, including antihistamines, steroids and cardiac medications, are alcohol-free. Treatment of the type II variant should be initiated with an acute coronary event protocol together with corticosteroids and antihistamines. Vasodilators, such as nitrates and calcium blockers, are given when deemed necessary. Beta-blockers can exaggerate coronary spasm due to unopposed action of alpha-adrenergic receptors. Epinephrine, which is the drug of choice and can save lives in anaphylaxis, can aggravate ischemia and worsen coronary vasospasm in Kounis syndrome. In severe cases, sulfite free epinephrine is preferable. It should be given intramuscularly because it has faster onset of action and more sustained levels as compared with the subcutaneous route. The recommended intramuscular dose is 0.2–0.5 mg [1:1000] and aqueous solution is preferable. In patients with previous history of coronary heart disease who receive beta-blockers, epinephrine may be ineffective and may induce more vasospasm due to unopposed alpha-adrenergic effect. In these patients, glucagon infusion at a rate of 1 to 5 mg intravenously over 5 min, followed by infusion of 5 to 15 μg/min, can be used. This applies to patients who are already on beta-blockers or received them during the management of the acute coronary syndrome . Methoxamine, a potent alpha agonist, can also be considered in patients who do not respond to epinephrine. Opiates given to relieve acute chest pain such as morphine, codeine, and meperidine, should be administered with extreme caution in patients with Kounis syndrome as they can induce massive mast cell degranulation and aggravate allergic reaction. Acetaminophen (Tylenol® or paracetamol), especially its intravenous administration, is not recommended because it might cause severe hypotension due to reduction of cardiac output. Fentanyl and its derivatives show only slight mast cell activation and are preferable. In type III variant, the current acute myocardial infarction protocol together with urgent aspiration of intrastent thrombus, followed by histological examination of aspirated material and staining for eosinophils (hematoxilin and eosin) and mast cells (Giemsa), should be undertaken. In patients who develop allergic symptoms following stent implantation, administration of antihistamines together with corticosteroids and mast cell stabilizers may relieve the symptoms. When symptoms persist, identification of the culprit cause by patch and/or prick skin tests should be ascertained and desensitization measures should be applied. If these measures fail, stent extraction seems unavoidable . Kounis syndrome seems to be a complex acute coronary syndrome that requires early diagnosis, followed by immediate and rapid treatment. After treatment of the acute shock and coronary event, a full cardiology work-up, including electrocardiograms and echocardiogram, along with cardiac risk factor modification, are necessary. An allergy work-up should also follow, and should include the assessment of allergies to drugs, food, insect stings, and other environmental agents. Hematology tests, skin tests, and food challenges are potentially useful in identifying the causal agent. Clark E. Serum Carditis: Morphologic cardiac alterations in man associated with serum disease. JAMA 1938; 110: 1098-1100. Wadsworth GM, Brown CH. Serum reaction complicated by acute carditis. J Pediat 1940; 17: 801-805. Rich AR, Gregory JE. Experimental evidence that lesions with basic characteristics of rheumatic carditis can result from anaphylactic hypersensitivity. Bull Johns Hopkins Hosp 1943; 73: 239-264. Pfister CW, Plice SG. Acute myocardial infarction during a prolonged allergic reaction to penicillin. Am Heart J 1950; 40: 945–947. Czickeli H. Contribution to the problem of the allergic etiology of angina pectoris and myocardial infarct. Klin Med Osterr Z Wiss Prakt Med 1950; 5: 364–367. Schultheiss E. Clinical aspects of allergic heart diseases. Dtsch Med J. 1964; 15: 15–18. Kounis NG. Coronary hypersensitivity disorder: the Kounis syndrome. Clin Ther 2013; 35: 563-571. Hasegawa S, Tashiro N, Matsubara T, Furukawa S, Ra C. A comparison of FcepsilonRI- mediated RANTES release from human platelets between allergic patients and healthy individuals. Int Arch Allergy Immunol 2001; 125 (Suppl 1): 42– 47. Akoz A, Tanboga HI, Emet M, Bayramoglu A, Kizrak Y, Kantarci M, et al. A prospective study of Kounis syndrome: Clinical experience and cardiac magnetic resonance imaging findings for 21 patients. Acta Med Mediterraea 2013, 9: 811-816. Renda F, Landoni G, Trotta F, Piras D, Finco G, Felicetti P, et al. Kounis Syndrome: An analysis of spontaneous reports from international pharmacovigilance database. Int J Cardiol 2016; 203: 217-220. Saylan B, Cevik A, Firat C. Kounis syndrome, a cause of chest pain to keep in mind, may be associated with E148Q mutation. Hong Kong J Emerg Med 2012; 19: 278-282. Kounis NG, Patsouras N, Grapsas N, Hahalis G. Histamine induced coronary artery spasm, fish consumption and Kounis syndrome. Int J Cardiol 2015; 193: 39-41. Pravettoni V, Primavesi L, Piantanida M. Anisakis simplex: current knowledge. Eur Ann Allergy Clin Immunol 2012; 44: 150-156. Tsigkas G, Chouchoulis K, Kounis NG, Alexopoulos D. Allergic reaction reveals a non-lethal late stent thrombosis. A new subtype of Kounis syndrome? Int J Cardiol 2011; 149: 281-182. Prasad A, Dangas G, Srinivasan M, Yu J, Gersh BJ, Mehran R, Stone GW. Incidence and angiographic characteristics of patients with apical ballooning syndrome (takotsubo/stress cardiomyopathy) in the HORIZONS-AMI trial: an analysis from a multicenter, international study of ST-elevation myocardial infarction. Catheter Cardiovasc Interv 2014; 83: 343-348. Cheng TO, Kounis NG. Takotsubo cardiomyopathy, mental stress and the Kounis syndrome. Int J Cardiol 2012; 161: 65-67. Jackson CE, Dalzell JR, Hogg KJ. Epinephrine treatment of anaphylaxis: an extraordinary case of very late acute stent thrombosis. Circ Cardiovasc Interv 2009; 2: 79-81. Kounis NG. Attack the ATAK : “οὓς ὁ θεός συνέζευξε, ἄνθρωπος μὴ χωριζέτω” (ous o theos synezeuxe anthropos me horizeto) “what therefore God hath joined together, let not man put asunder”. Int J Cardiol 2016; 203: 960-961. Lippi G, Buonocore R, Schirosa F, Cervellin G. Cardiac troponin I is increased in patients admitted to the emergency department with severe allergic reactions. A case-control study. Int J Cardiol 2015; 194: 68-9. Okur A,Kantarci M, Karaca L, Ogul H, Aköz A, Kızrak Y, et al. The utility of cardiac magnetic resonance imaging in Kounis syndrome. Postepy Kardiol Interwencyjnej 2015; 11: 218-23. Cevik C, Nugent K, Shome GP, Kounis NG. Treatment of Kounis syndrome. Int J Cardiol 2010; 143: 223–226. Atoui R, Mohammadi S, Shum-Tim D. Surgical extraction of occluded stents: when stenting becomes a problem. Interact Cardiovasc Thorac Surg 2009; 9: 736-738.